The United States House of Representatives (or simply the House) is one of the two chambers of the United States Congress, the other being the Senate. Each state is represented in the House proportionally to its population, and is entitled to at least one Representative. The total number of Representatives is currently fixed at 435 by the Reapportionment Act of 1929, though Congress has the authority to change that number. Each Representative serves for a two-year term and may be re-elected an unlimited number of times. The presiding officer of the House is known as the Speaker, and is elected by the members. The present House delegations by state are shown in the article List of U.S. states by population. The bicameral Congress arose from the desire of the Founders to create a "house of the people" that would represent public opinion, balanced by a more deliberative Senate that would represent the governments of the individual states, and would be less susceptible to variations of mass sentiment. The House is often considered the " lower house," and the Senate as the " upper house," although the United States Constitution does not use such language. The Constitution provides that the approval of both houses is necessary for the passage of legislation. The House is generally considered a more partisan chamber than the Senate. Many of the Founding Fathers intended the Senate (whose members were originally chosen by the state legislatures) to be a check on the popularly elected House, just as the House was to be a check on the Senate. The " advice and consent" powers (such as the power to approve treaties) were therefore granted to the Senate alone. The House was granted its own exclusive powers: the power to initiate revenue bills, impeach officials, and elect the President in electoral college deadlocks. The Senate, however, can propose amendments to spending bills, try impeached officials, and choose the Vice President in an electoral college deadlock. The Senate and its members generally have greater prestige than the House since Senators serve longer terms (six years) in a smaller body and (in most cases) represent larger constituencies than Representatives. The chamber of the United States House of Representatives is located in the south wing of the Capitol building, in Washington, D.C. This photograph shows a rare glimpse of the four vote tallying boards (the blackish squares across the top), which display each member's name and vote as votes are in progress. The screens are famously used by Congressional leaders to identify which members are voting against party lines. Under the Articles of Confederation, Congress was a unicameral body in which each state held one vote. The ineffectiveness of the federal government under the Articles led Congress to summon a Constitutional Convention in 1787; all states except Rhode Island agreed to send delegates. The issue of how Congress was to be structured was one of the most divisive during the Convention. James Madison's Virginia Plan called for a bicameral Congress; the lower house would be elected directly by the people, and the upper house would be elected by the lower house. The plan drew the support of delegates from large states such as Virginia, Massachusetts, and Pennsylvania, as it called for representation based on population. The smaller states, however, favored the New Jersey Plan, which called for a unicameral Congress with equal representation for the states. 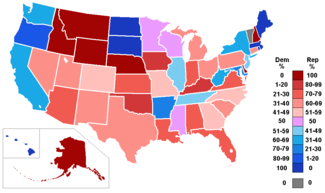 Eventually, the Convention reached the Connecticut Compromise, or the Great Compromise, under which one house of Congress (the House of Representatives) would provide representation proportional to each state's population, whereas the other (the Senate) would provide equal representation. The Constitution was ratified by the requisite number of states (nine out of the 13) in 1788, but its full implementation was set for March 4, 1789. The House began work on April 1, 1789, when it achieved a quorum for the first time. During the first half of the nineteenth century, the House was frequently in conflict with the Senate over sectionally divisive issues, including slavery. The North was much more populous than the South, and therefore dominated the House of Representatives. However, the North held no such advantage in the Senate, where the equal representation of states prevailed. Sectional conflict was most pronounced over the issue of slavery. One example of a provision repeatedly supported by the House but blocked by the Senate was the Wilmot Proviso, which sought to ban slavery in the land gained during the Mexican-American War. Conflict over slavery and other issues persisted until the Civil War (1861–1865), which began soon after several southern states seceded from the Union. The war culminated in the South's defeat and in the abolition of slavery. The years of Reconstruction that followed witnessed large majorities for the Republican Party, which many Americans associated with the Union's victory in the Civil War. Reconstruction ended in about 1877; the ensuing era, known as the Gilded Age, was marked by sharp political divisions in the electorate. Both the Democratic and the Republican Party held majorities in the House at various times. The late 19th and early 20th centuries also saw a dramatic increase in the power of the Speaker of the House. The rise of the Speaker's influence began in the 1890s, during tenure of Republican Thomas Brackett Reed. " Czar Reed," as he was nicknamed, attempted to put into effect his view that "The best system is to have one party govern and the other party watch." The leadership structure of the House also developed during approximately the same period, with the positions of Majority Leader and Minority Leader being created in 1899. While the Minority Leader was the head of the minority party, the Majority Leader remained subordinate to the Speaker. The Speakership reached its zenith during the term of Republican Joseph Gurney Cannon, 1903 to 1911. The powers of the Speaker included chairmanship of the influential Rules Committee and the ability to appoint members of other House committees. These powers, however, were curtailed in the "Revolution of 1910" because of the efforts of Democrats and dissatisfied Republicans who opposed Cannon's arguably heavy-handed tactics. The Democratic Party dominated the House of Representatives during most of the administration of President Franklin D. Roosevelt (1933–1945), often winning over two-thirds of the seats. Both Democrats and Republicans were in power at various times during the next decade. The Democratic Party maintained control of the House from 1954 until 1995. In the mid-1970s, there were major reforms of the House, strengthening the power of sub-committees at the expense of committee chairmen and allowing party leaders to nominate committee chairs. These actions were taken to undermine the "seniority" system, and to reduce the ability of a small number of senior members to obstruct legislation they did not favour. There was also a shift from the 1970s to greater control of the legislative program by the majority party; in particular, the power of party leaders (especially the Speaker) grew considerably. The Republicans took control of the House in 1995, under the leadership of Speaker Newt Gingrich (see Republican Revolution). Gingrich attempted to pass a major legislative program, the Contract with America on which the House Republicans had been elected, and made major reforms of the House, notably reducing the tenure of committee chairs to three two-year terms. Many elements of the Contract did not pass Congress, were vetoed by President Bill Clinton, or were substantially altered in negotiations with Clinton. The Republicans would hold on to the House until the United States Congressional elections, 2006, during which the Democrats won back control of both the House of Representatives and the Senate. Under Article I, Section 2 of the Constitution, seats in the House of Representatives are apportioned among the states on the basis of population, as determined by the census conducted every ten years. Each state, however, is entitled to at least one Representative. The only constitutional rule relating to the size of the House says "The Number of Representatives shall not exceed one for every thirty Thousand." (see Article I, Section 2) As the population of the United States increased, Congress regularly increased the size of the House after the census to account for growth; but the limit became obsolete when Congress fixed the size of the House at 435 seats in 1911 (see Public Law 62-5). The figure was temporarily increased to 437 in 1959 to reflect the admission of Alaska and Hawaii as states, but returned to 435 four years later. The Constitution does not provide for the representation of the District of Columbia or of territories. However, Congress has passed legislation permitting them to elect delegates or Resident Commissioners. Delegates and Resident Commissioners are permitted to participate in debates and to vote in committees, but they may not vote on the floor of the House. The District of Columbia and the territories of American Samoa, Guam, and the U.S. Virgin Islands are represented by one delegate each. Puerto Rico elects a Resident Commissioner, who is the only member of Congress elected to a four-year term; other than his longer term, however, his role is identical to the delegates from the other territories. The Northern Mariana Islands do not currently elect any sort of representative to Congress, although legislation has been introduced by Rep. Richard Pombo of California that would allow them to do so. Because Congress does not allow the District of Columbia voting representation in Congress, a common phrase has been adopted in the city. Taxation Without Representation is now a term used by D.C. residents on their license plates and other various locations. The movement to give Washington, D.C. a voting representation in Congress has become so widespread that Rep. Thomas M Davis (R-VA 11), supported by Delegate Eleanor Holmes Norton, the sole representative from D.C., has introduced legislation in the House that if passed would permit the District of Columbia to have a voting seat in the House (H.R. 5388). States that are entitled to more than one Representative are divided into single-member districts (see General ticket). Typically, states redraw these district lines (see redistricting) after each census, though they may do so at other times (see 2003 Texas redistricting). Each state determines its own district boundaries, either through legislation or through non-partisan panels. " Malapportionment" is unconstitutional and districts must be approximately equal in population (see Wesberry v. Sanders). The Voting Rights Act prohibits states from " gerrymandering" districts to reduce racial minorities' voting power. Using gerrymandering for political gain is not prohibited, even when political gerrymandering incidentally involves the creation of racially concentrated districts. Because of gerrymandering, fewer than 10% of all House seats are seriously contested in each election cycle. Since over 90% of House members are nearly guaranteed reelection every two years because of lack of electoral competition, elections have been criticized as being contrary to fair competition, one of the principles of democracy. The legal gerrymandering of the House, combined with the institutionalized gerrymandering of the Senate and the Electoral College, have been criticized as being antithetical to democracy and representative government. Article I, Section 2 of the Constitution sets forth three qualifications for representatives: each representative must be at least twenty-five years old, must have been a citizen of the United States for the past seven years, and must be (at the time of the election) an inhabitant of the state they represent. It is not, however, required for the representative to live in the district they will represent. The age and citizenship qualifications for representatives are less stringent than those for senators. Furthermore, under the Fourteenth Amendment, any federal or state officer who takes the requisite oath to support the Constitution, but later engages in rebellion or aids the enemies of the United States, is disqualified from becoming a representative. This provision, which came into force soon after the end of the American Civil War, was intended to prevent those who sided with the Confederacy from serving. The Amendment, however, allows a disqualified individual to serve if they gain consent of two-thirds of both Houses of Congress. Elections for representatives are held in every even-numbered year, on the first Tuesday after the first Monday in November (see Election Day (United States)). Generally, the Republican and Democratic parties choose their candidates for each district in primary elections, which are typically held several months before. Rules for independent and third-party candidates seeking a spot on the November ballot vary from state to state. For the general election, almost all states use the first-past-the-post system, under which the candidate with a plurality of votes (not necessarily an absolute majority) wins. The sole exception is Louisiana, which holds an all-party "primary election" on the general Election Day, with a subsequent runoff election between the top two finishers (regardless of party) if no candidate receives a majority in the primary. Seats vacated during a term are filled through special elections, though that election will sometimes not take place until the next general election date. Representatives and delegates serve for two-year terms, while the Resident Commissioner serves for four years. Once elected, a representative continues to serve until the expiry of his term, death, or resignation. Furthermore, the Constitution permits the House to expel any member with a two-thirds vote. In the history of the United States, only five members have been expelled from the House; three of them were removed in 1861 for supporting the Confederate States' secession, which led to the Civil War. In 1980, Michael Myers was expelled for accepting bribes and James Traficant was expelled in 2002 following his conviction for corruption. The House also has the power to formally censure its members; censure requires only a simple majority, but does not remove a member from office. Representatives use the prefix " The Honorable" before their names. A member of the House, including Delegates and the Resident Commissioner, is commonly referred to as a "Congressman" or "Congresswoman." Although the Senate also forms a part of Congress, these terms are generally not applied to Senators. The term "Representative" is also used to refer to a member of the House, although this term is less frequently used. Among academics and journalists, the term "Member of Congress" (MC) is gaining popularity in reference to members of both houses, with "Representative" replacing "Congressman." The annual salary of each Representative is currently $165,200, though the Speaker of the House and the Majority and Minority Leaders earn more. The Speaker of the House earned $212,100 during the 109th Congress (January 4, 2005-January 3, 2007) while the Majority and Minority Leaders earned $183,500 (the same as the Leaders in the United States Senate). A cost-of-living-adjustment (COLA) increase takes effect annually unless Congress votes to not accept it. Congress has the power to set members' salaries; however, the Twenty-Seventh Amendment prohibits a change in wages from taking effect in the same two-year term in which it is passed into law. The party with a majority of seats in the House is known as the majority party; the next-largest party is the minority party. The Speaker, committee chairmen, and some other officials are generally from the majority party; they have counterparts (for instance, the "ranking members" of committees) in the minority party. The Constitution provides that the House may choose its own Speaker. Although not explicitly required by the Constitution, every Speaker has been a member of the House. The Constitution does not specify the duties and powers of the Speaker, which are instead regulated by the rules and customs of the House. The Speaker has a role both as a leader of the House and the leader of his or her party (which need not be the majority party; theoretically, a member of the minority party could be elected Speaker with the support of a fraction of members of the majority party). Under the Presidential Succession Act (1947), the Speaker is second in the line of presidental succession behind the Vice President. The Speaker is the presiding officer of the House, but does not preside over every debate. Instead, he or she delegates the responsibility of presiding to other members in most cases. The presiding officer sits in a chair in the front of the House chamber. The powers of the presiding officer are extensive; one important power is that of controlling the order in which members of the House speak. No member may make a speech or a motion unless he or she has first been recognized by the presiding officer. Moreover, the presiding officer may rule on any " point of order" (a member's objection that a rule has been breached), but the decision is subject to appeal to the whole House. The Speaker is the chair of his or her party's steering committee, which chooses the chairmen of standing committees. The Speaker determines which committees consider bills, appoints most of the members of the Rules Committee, and appoints all members of conference committees. When the Presidency and Congress are controlled by different parties, the Speaker can become the de facto "leader of the opposition." Since the Speaker is a partisan officer with substantial power to control the business of the House, the position is often used for partisan advantage. Each party elects a floor leader, who is known as the Majority Leader or Minority Leader. While the Minority Leader is the full leader of his party, the same is not true of the Majority Leader. Instead, the Speaker is the head of the majority party; the Majority Leader is only the second-highest official. Party leaders decide what legislation members of their party should either support or oppose. Each party also elects a whip, who works to ensure that the party's members vote as the party leadership desires. Representatives are generally less independent of party leaders than senators, and usually vote as the leadership directs. Incentives to cooperate include the leadership's power to select committee chairmen. As a result, the leadership plays a much greater role in the House than in the Senate, and the atmosphere of the House is regarded by many as more partisan. The House is also served by several officials who are not members. The House's chief officer is the Clerk, who maintains public records, prepares documents, and oversees junior officials, including pages. The Clerk also presides over the House at the beginning of each new Congress pending the election of a Speaker. Another officer is the Chief Administrative Officer, responsible for the day-to-day administrative support to the House of Representatives. This includes everything from payroll to food service. The position of Chief Administrative Officer was created following the 1994 Republican Revolution and replaced the positions of Doorkeeper and Director of Non-Legislative and Financial Services (which had been created only two years prior to provide a nonpartisan management body to administer those functions of the House that should not be under partisan control). The Chaplain leads the House in prayer at the opening of the day. There is also a Sergeant at Arms, who as the House's chief law enforcement officer, maintains order and security on House premises. Finally, routine police work is handled by the Capitol Police, which is supervised by the Capitol Police Board, a body to which the Sergeant-at-Arms belongs. 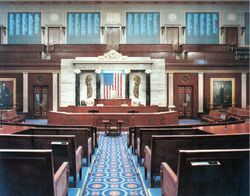 Like the Senate, the House of Representatives meets in the United States Capitol in Washington, D.C. At one end of the chamber of the House is a rostrum from which the Speaker presides. The lower tier of the rostrum is used by clerks and other officials. Members' desks are arranged in the chamber in a semicircular pattern; the desks are divided by a wide central aisle. By tradition, Democrats sit on the right of the centre aisle, while Republicans sit on the left, as viewed from the presiding officer's chair. Sittings are normally held on weekdays; meetings on Saturdays and Sundays are rare. Sittings of the House are generally open to the public and are broadcast live on television by C-SPAN. The procedure of the House depends not only on the rules, but also on a variety of customs, precedents, and traditions. In many cases, the House waives some of its stricter rules (including time limits on debates) by unanimous consent. Any member may block a unanimous consent agreement, but in practice, objections are rare. The presiding officer enforces the rules of the House, and may warn members who deviate from them. The presiding officer uses a gavel to maintain order. The box in which legislation is placed to be considered by the House is called the hopper. The Constitution provides that a majority of the House constitutes a quorum to do business. Under the rules and customs of the House, a quorum is always assumed to be present unless a quorum call explicitly demonstrates otherwise. Any member may make a point of order that a quorum is not present; if the presiding officer accepts the point of order, a quorum call may be held. Although a majority of members are not normally present during debates, objections that a quorum is not present are rarely made. During debates, a member may only speak if called upon by the presiding officer. The presiding officer may determine which members to recognize, and may therefore control the course of debate. All speeches must be addressed to the presiding officer, using the words "Mr. Speaker" or "Madam Speaker." Only the presiding officer may be directly addressed in speeches; other members must be referred to in the third person. In most cases, members do not refer to each other by name, but by state, using forms such as "the gentleman from Virginia" or "the gentlewoman from California." Before legislation reaches the floor of the House, the Rules Committee normally passes a rule to govern debate on that measure. For instance, the committee determines if amendments to the bill are permitted. An "open rule" permits all germane amendments, but a "closed rule" restricts or even prohibits amendment. Debate on a bill is generally restricted to one hour, equally divided between the majority and minority parties. Each side is led during the debate by a "floor manager," who allocates debate time to members who wish to speak. On contentious matters, many members may wish to speak; thus, a member may receive as little as one minute, or even thirty seconds, to make his point. When debate concludes, the motion in question is put to a vote. In many cases, the House votes by voice vote; the presiding officer puts the question, and Members respond either "Yea" (in favour of the motion) or "Nay" (against the motion). The presiding officer then announces the result of the voice vote. Any member, however, may challenge the presiding officer's assessment and "request the yeas and nays" or "request a recorded vote." The request may be granted only if it is seconded by one-fifth of the members present. In practice, however, members of congress second requests for recorded votes as a matter of courtesy. Recorded votes are automatically held in some cases, such as votes on the annual budget. The House may vote in three manners. Firstly, the House may vote by electronic device; each member uses a personal identification card to record his vote at one of 46 voting stations in the chamber. Votes are almost always held by electronic device. Secondly, the House may conduct a teller vote. Members hand in colored cards to indicate their votes: green for "Yea," red for "Nay," and orange for "Present" (i.e., to abstain). Teller votes are normally held only when the computer system breaks down. Finally, the House may conduct a roll call vote. The Clerk reads the list of members of the House, each of whom announces his vote when his name is called. This procedure is reserved for very formal votes (such as the election of a Speaker) because of the time consumed by calling over four hundred names. Voting traditionally lasts for fifteen minutes, but it may be extended if the leadership needs to "whip" more Congressmen into alignment. The 2003 vote on the Prescription Drug Benefit was open for three hours, from 3:00 to 6:00 a.m. The 2005 vote on CAFTA was open for one hour, from 11:00 p.m. to 12:00 a.m. An October 2005 vote on facilitating refinery construction was kept open for forty minutes. The presiding officer may vote, like any other member. If a vote is tied, the presiding officer does not have a casting vote (unless he has not yet cast his vote). Instead, motions are decided in the negative when ties arise. The largest committee of the House is the Committee of the Whole, which, as its name suggests, consists of all members of the House. The Committee meets in the House chamber; it may consider and amend bills, but may not grant them final passage. Generally, the debate procedures of the Committee of the Whole are more flexible than those of the House itself. Most committee work is performed by twenty standing committees, each of which has jurisdiction over a specific field such as Agriculture or International Relations. Each standing committee considers, amends, and reports bills that fall under its jurisdiction. Committees have extensive powers with regard to bills; they may block legislation from reaching the floor of the House. Standing committees also oversee the departments and agencies of the executive branch. In discharging their duties, standing committees have the power to hold hearings and to subpoena witnesses and evidence. The House also has one permanent committee that is not a standing committee, the Permanent Select Committee on Intelligence. Furthermore, the Congress includes joint committees, which include members of both the Senate and the House of Representatives. Some joint committees oversee independent government bodies; for instance, the Joint Committee on the Library oversees the Library of Congress. Other joint committees serve to make advisory reports; for example, there exists a Joint Committee on Taxation. Bills and nominees are not referred to joint committees. Hence, the power of joint committees is considerably lower than those of standing committees. Formerly, committee chairmanship was determined purely by seniority; however, the rules were changed in 1975 to permit party caucuses to elect chairmen. In 1995, Republicans under Newt Gingrich set a limit of three two-year terms for committee chairmen. The chairman's powers are extensive; he controls the committee's agenda, and may prevent the committee from approving a bill. Modern committee chairmen are typically not forceful in exerting their influence, although there have been some exceptions. The second-highest member, the spokesperson on the committee for the minority party, is known in most cases as the Ranking Member. The approval of both the Senate and the House of Representatives is required for any bill, including a revenue bill, to become law. Both Houses must pass the exact same version of the bill; if there are differences, they may be resolved by a conference committee, which includes members of both bodies. For the stages through which bills pass in the Senate, see Act of Congress. The Constitution provides that the Senate's "advice and consent" is necessary for the President to make certain appointments, and to ratify treaties, however the House must also confirm the nomination of a new Vice President under the 25th Amendment. Thus, in terms of potential to frustrate Presidential appointments, the powers of the Senate are more extensive than those of the House. In the history of the United States, the House of Representatives has impeached sixteen officials, of whom seven were convicted. (Another, Richard Nixon, resigned after the House Judiciary Committee passed Articles of Impeachment but before a formal impeachment vote by the full House.) Only two Presidents of the United States have ever been impeached: Andrew Johnson in 1868 and Bill Clinton in 1999. Both trials ended in acquittal; in Johnson's case, the Senate fell one vote short of the two-thirds majority required for conviction. Under the Twelfth Amendment, the House has the power to elect the President if no presidential candidate receives a majority of votes in the electoral college. The Twelfth Amendment requires the House to choose from the three candidates with the highest numbers of electoral votes. The Constitution provides that "the votes shall be taken by states, the representation from each state having one vote." Electoral college deadlocks are very rare; in the history of the United States, the House has only had to break a deadlock twice. In 1800, it elected Thomas Jefferson over Aaron Burr; in 1824, it elected John Q. Adams over Andrew Jackson and William H. Crawford. The power to elect the Vice President in the case of an electoral college deadlock belongs to the Senate. 1 Vacancy: death of Patsy Mink ( D- Hawaii). Data subject to change as the remaining races are tallied.